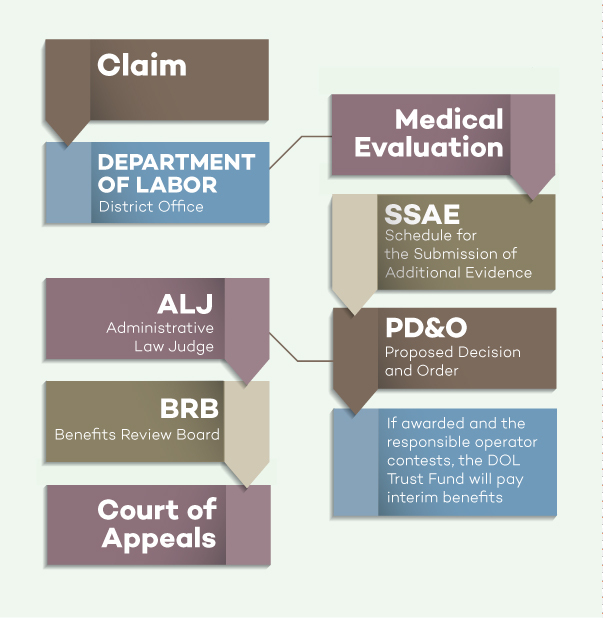 This flow chart illustrates the often long and drawn-out process of receiving black lung benefits. Information about the Black Lung Benefits Program, including the address and phone number of the U.S. Department of Labor Office of Workers’ Compensation Programs district office nearest you, is available at http://www.dol.gov/owcp/dcmwc/regs/compliance/blbenact.htm. The health care reform bill signed into law on March 23, 2010 has two important amendments which may affect black lung benefits claims of disabled miners and survivors (widows). The Black Lung Benefits Act has been amended so that a widow is automatically entitled to benefits if the miner had been awarded benefits at the time of his death. The change applies only to claims filed after January 1, 2005. The other amendment in the Black Lung Benefits Act applies to both miners and widows. This amendment states that a miner with at least fifteen years of underground coal mine employment or surface mine work with similar dust exposure who has a totally disabling lung impairment is entitled to the presumption that the disability is due to pneumoconiosis. In a survivor’s claim, there is a presumption that the miner’s death was due to pneumoconiosis. This change also applies only to claims filed after January 1, 2005, and that are pending on or after March 23, 2010. The presumption that disability or death is due to pneumoconiosis shifts the burden of proof tothe responsible operator or Director, OWCP, to rebut the presumption. The presumption may be rebutted by proving the miner did not have pneumoconiosis or by proving the miner’s disabling impairment or death was not due to his coal mine employment. Both of the amendments are part of the Patient Protection and Affordable Care Act of 2010 and are contained in Section 1556 of that law. Section 1556 of the PPACA went into effect upon enactment on March 23, 2010.